When chatting up the benefits of keeping chickens, few mention the battle to keep clean, soft nesting material in a nesting box with hens that are constantly “rearranging” their nest. If you’ve kept chickens for long, chances are you’ve found yourself cleaning raw egg out of a nesting box more than once. Rearranging their nest is a normal part of chicken nesting behavior, but it often means clearing a once softly-bedded nesting box to a hard piece of wood covered only by a few sparse pieces of straw. Once the bottom of the nest is exposed it’s easy for a hen to accidentally break eggs. After cleaning up many broken eggs, I decided to experiment with materials to create a a soft nest base that would be easy to clean and impossible to move. 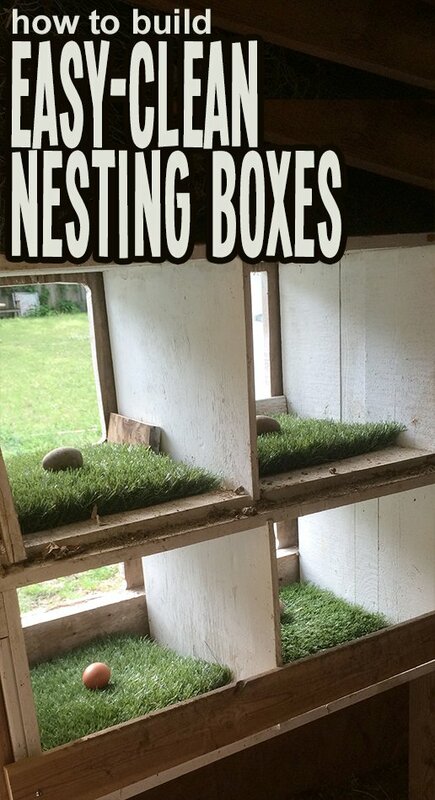 I wondered if it could work to line the nesting boxes in thick astroturf. Astroturf by the square foot this upgrade paid for itself by eliminating broken eggs in nests. 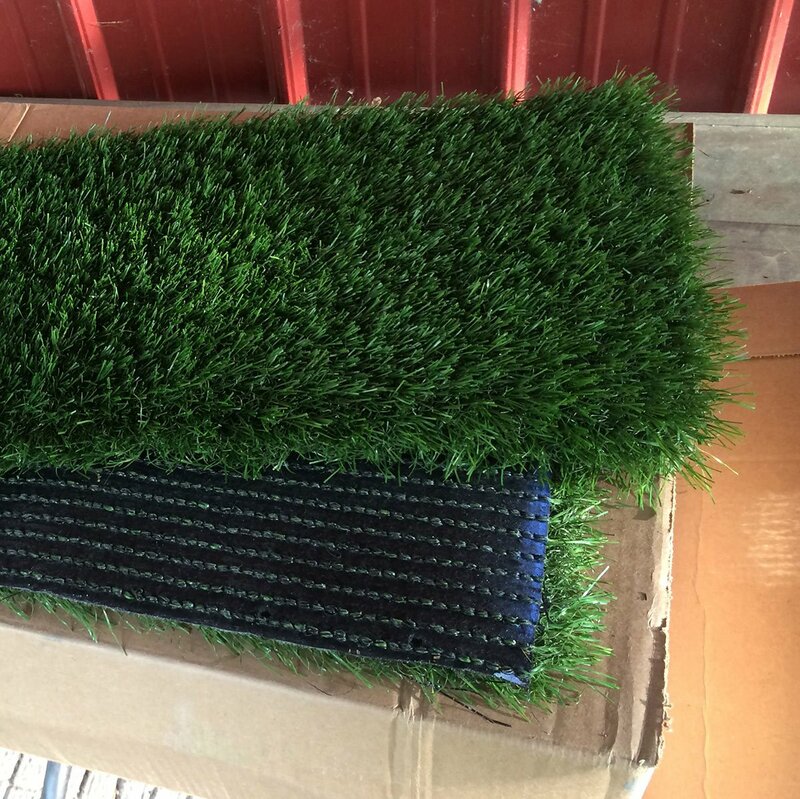 Thin mini-golf type putting-green turf might work for providing a base underneath a straw nest, but I was curious about experimenting with astroturf as the only nesting material provided, so I purchased a few square feet of thick synthetic turf. 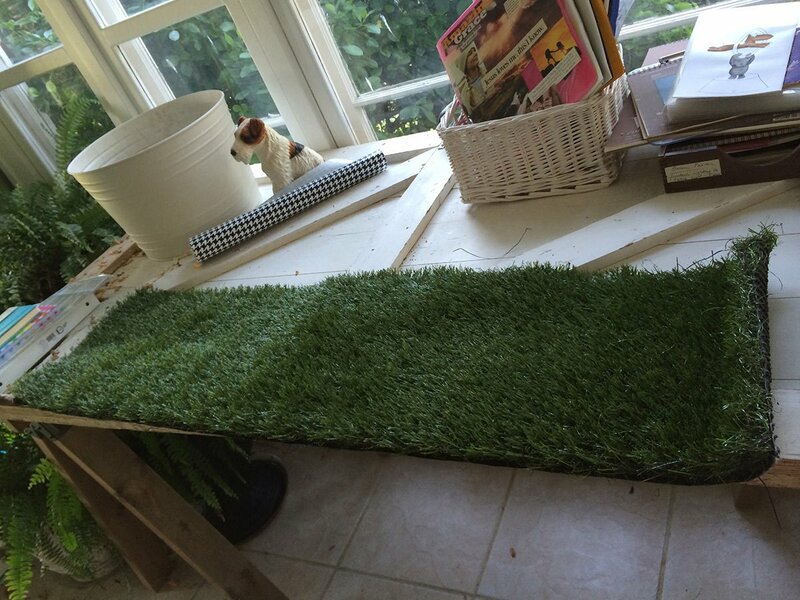 The turf I used for my coop is about 1.5″ deep, very dense, and soft to the touch. Buy it buy the square foot here. Thin outdoor carpet style turf that putting greens use is easier to find, but I didn’t think it would cushion enough or simulate natural bedding. Thick football-field style astroturf is a deep and soft nesting material. Read on for a step by step tutorial of my process. 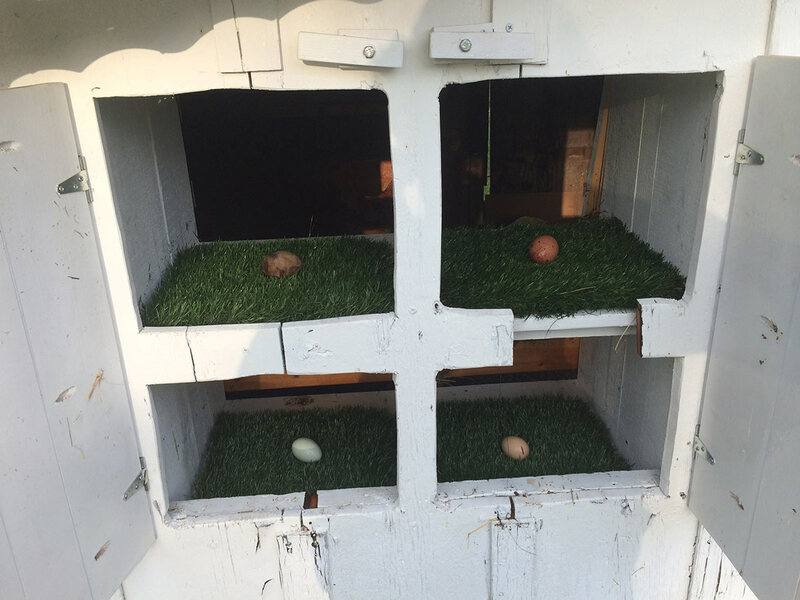 When I initially introduced the new synthetic bedding the hens briefly revolted, however placing wooden eggs in the center of each newly bedded nest and blocking off the alternate area they were nesting in during their protest resulted in total success. When I first penned this article, I’d been using the mats as nest liner for 8 weeks and was immediately pleased with the result. We were able to clean them easily by removing the mats and smacking them against the side of the coop like a rug. This removes the vast majority of debris. The soft mats have completely ended egg-loss due to eggs hitting hard boards under scattered straw bedding, I expect cleaning up tougher messes will involve just a brief soak in a bucket and hosing off. 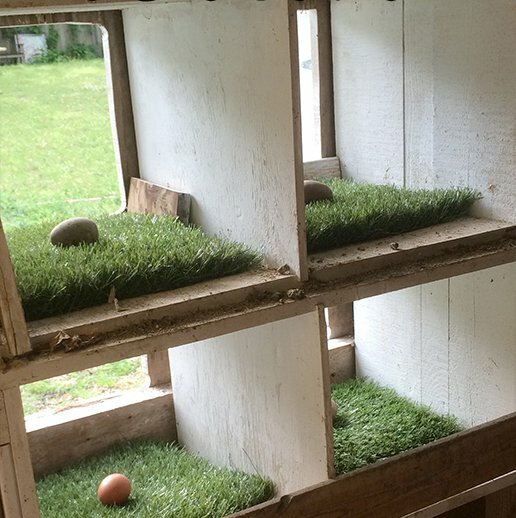 I bought a 12″ x 48″ strip of astroturf and cut it into squares sized to fit in my coop’s nesting boxes. First, I totally cleaned out my nesting boxes. Then I added a few strips of silicone caulking to the bottom of my new mats to add a non-slip grip to help keep the turf mats from slipping. I allowed the caulking to completely dry before adding the turf to the nesting boxes, since I did not want to glue the mats down, only provide traction. Once I blocked off the alternate area above the nesting boxes, success was immediate! 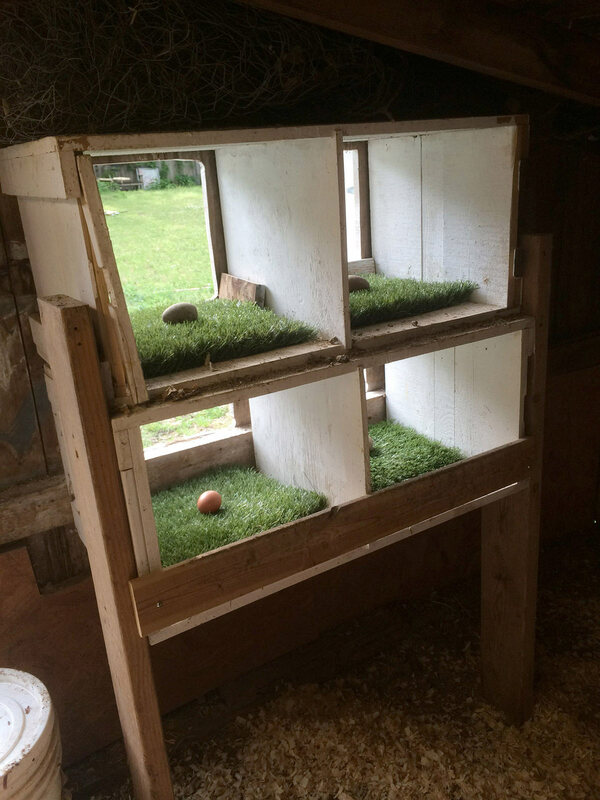 Almost immediately my hens began happily laying eggs in their astro-turf lined nesting boxes. Aside from being easy to clean, I really like that this nesting medium makes it very easy to spot any droppings in the nest. Dirt and droppings tend to blend into a straw nest and often end up transferring to the eggshells. With the astroturf nest I can see right away when I need to pull a mat and shake it off, and my eggs are cleaner than ever. 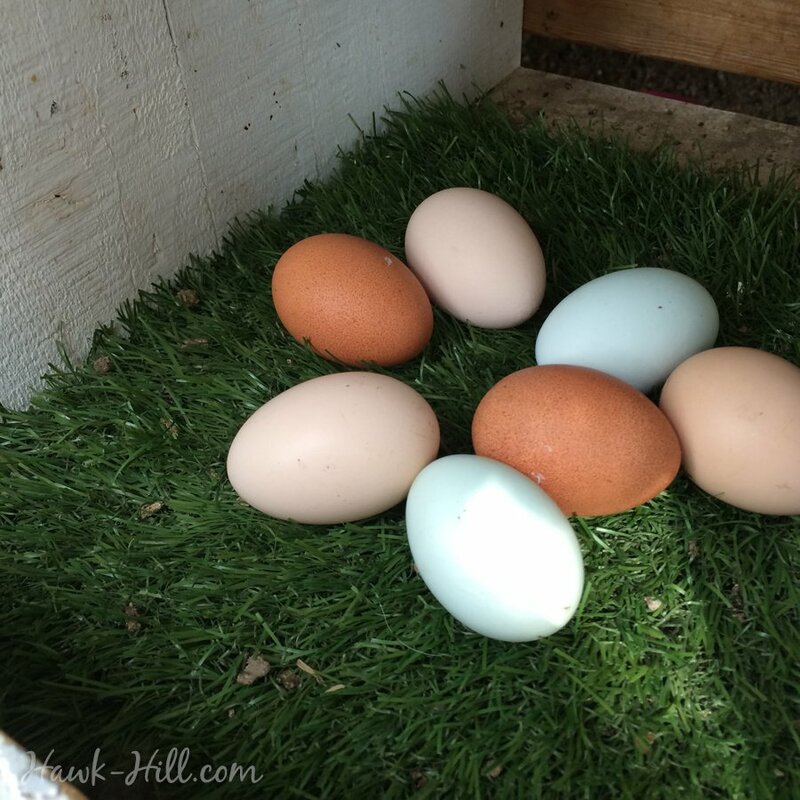 Bright green bedding makes it easy to spot when the nesting box needs cleaned, which means cleaner eggs and no need to wash off the natural protective coating before selling. Thanks for checking out this tutorial. If you sell your eggs for $4/dozen, and if this tip saves 1 egg per week from breaking, then this article saved you $19 over the next year! Would you consider saying thanks by buying me a coffee or becoming a $1/month patron of the creative cavorting that keeps Hawk Hill rolling? Years in, I still LOVE these liners! My hens have fully adapted to laying eggs on the astro-turf and I even had two chickens happily go broody on the artificial grass lined nests last summer. With two broody hens in attack mode and several weeks of temperatures in the 100’s, I was not good about collecting eggs regularly last August. As a result, my nests and turf liners ended up really dirty, with broken shells and rotten egg dried to the mat. 1. I pulled mats out of nesting boxes and slapped against the side of the coop to dislodge loose debris. 3. I left the mats to sit in vinegar water for about 30 minutes. 4. After 30 minutes, I dumped the now-dirty vinegar water, then refilled the bucket with clean water, sloshed mats around, and dumped. I repeated this rinse 3-4 times until water ran clear. The artificial grass was like a sponge to clean, so once the dried-on egg was soaked and soft, they cleaned up easily. 5. I think the mats could have gone back in the coop the same afternoon, but I left them on the coop’s roof to dry overnight and placed the artificial grass mats back in the nesting box the next morning. 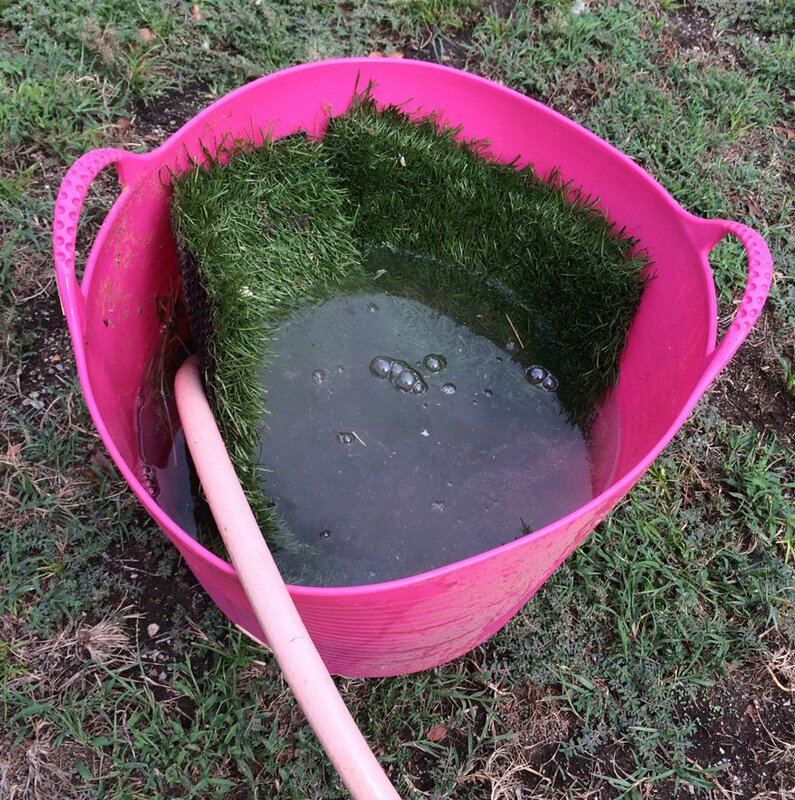 Turf nesting liners are easy to deep clean with a bucket, vinegar, and water. A few of the comments below have been about the environmental impact of using astroturf nesting box liners vs traditional straw for lining nesting boxes. It’s an important point to consider, but I think at the end of the day it’s probably a wash due to the durability and reusability of the astroturf. Straw, which is quickly scattered and requires replacement, is grown in fields that may require irrigation, harvested by heavy machinery, and trucked to agricultural supply stores. Astroturf, although not biodegradable, works for years and years (I’m using the same mats now that I cut in 2013/2014) and because of that probably does not have a greater environmental impact than using straw. Love your AstroTurf idea! Only thing better would be another set of mats so you could rotate a clean set while you wash/dry the soiled set. This is a genius idea. I would never have thought of it. This is a cute idea. However, given that there is evidence that Astro turf is causing cancer in child athletes, I’m not sure if it is a very safe alternative. I wonder if it’s the turf that’s the issue or the “dirt” pellets. This sounds like an awesome idea just don’t use the crumb rubber layer underneath and you are good to go. There has been no research connecting cancer with astro turf as yet. There seems to be correlation specifically with goal keepers who have developed lymphoma and it is postalized that this is because of their much more close interaction with the turf and the crumb rubber layer beneath. I attend the University of Washington School of Medicine and the initial work was started by the University of Washington women’s soccer coach. That doesn’t mean there is not a link, just that there is no body of evidence to support the connection as yet. Here is an article that sums up the issue pretty well. https://blog.oup.com/2017/01/artificial-turf-cancer-risk/. Great idea, I’ll definitely be doing this!!!!! We have been using the astro turf for a year + now. As soon as they get a little dirty they get smacked out like a carpet. BUT! we noticed little black bugs and worm type bugs under the mats. Once the mat is removed they scurry and seemingly disappear until the mat is replaced and they then return. We took our “girls” to auction and noticed the next morning that the little bugs were all in the boxes still but dead. No chickens = death to the bugs. The coop and mats were given a pressure washing and left to dry for 3 days before the next round of chickens. Any idea how to keep the bugs from reappearing? Love, love the mats. That’s interesting! I wonder what they were, and if they are linked to the AstroTurf bedding or just noticable because it is so easy to clean and doesn’t leave little pieces of debris like stray bedding. I’d try dusting the boxes, under the mats, with diatomaceous earth powder, and maybe a bit on top of the turf as well so it would settle down into the fibers. Please use food grade diatomaceous earth only. Also when one hen went off lay and morose I boiled up rice added dessertspoon of DE mixed it, warm, and boy did the hens go for it! Quite a cure I believe for worms. will use it again! I have these little bugs too and I use straw in my coop. I also use food grade DE and I still get them. I haven’t a clue as to what they are, but as near as I can tell they haven’t hurt my chickens. It’s a mystery. I have spent some time here this morning perusing all the posts on your 100 year old coop. I love it! Simple, functional and very cute from the outside. Thank you for sharing it! Thank you! It was such a fun project to update but keep all the charm! Hi Alissa! Thanks for your questions! I’m not sure if these pads would harbor mites- but am pretty confident they’d be easy to pre-treat- or clean if they did get infected. You might just want to sprinkle some of whatever you are using to treat your mite problem directly onto the turf pads before installation. They hold up great to scratching and pecking! 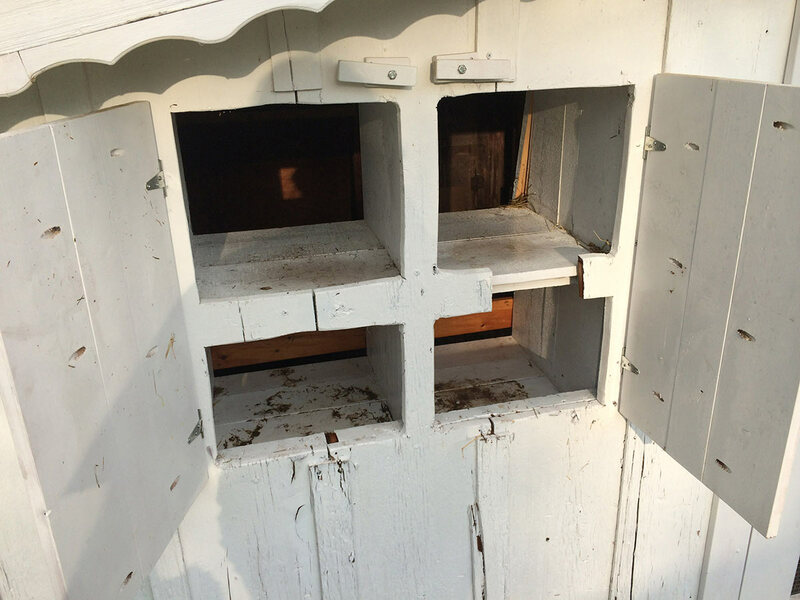 I do have one tip you might try to fix the issue of chickens sleeping in the nesting boxes: make sure your coop’s roost is higher than the nesting boxes. You may need to raise your roost or lower you nesting boxes but chickens will naturally sleep in the highest position that looks cozy. Also because it’s now habit to sleep in the nesting boxes, you may want to temporarily start preventing access to the nesting boxes from late afternoon to morning. You could try a tarp-curtain tacked across the entrance or something more sturdy like a sheet of plywood.